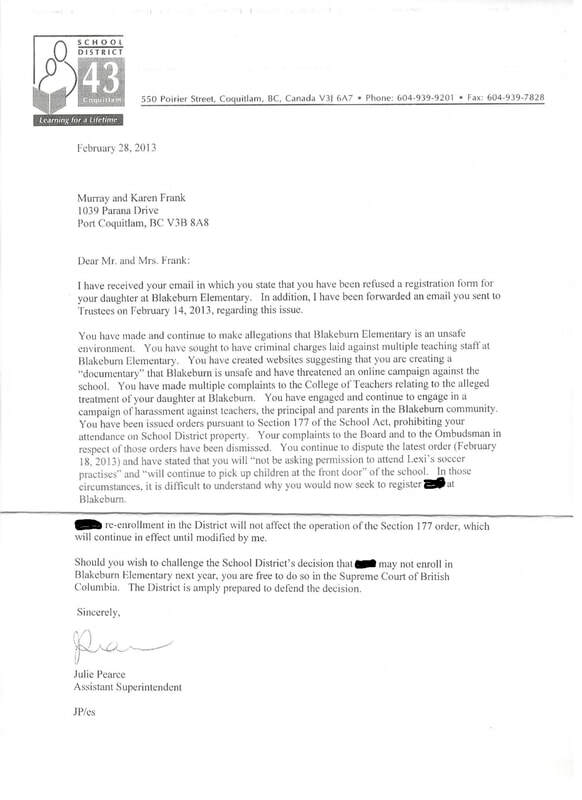 2) "you have created a website"
3) "you have made allegations" ( against a teacher ). The last passage in Julie Pearce's letter truly captures the sad but growing nasty of British Columbia bullies in governance. School districts & the BC government are aware the vast majority of citizens (parents & children) can't afford thousands of dollars & time off work to challenge Sec.177 injustice. But Ms Pearce & other bullies know corrupt/oppressive BC politicians (Liberals & NDP) will supply millions of dollars (of taxpayer money) supporting school superintendents with time off work & the most expensive legal representation to beat down citizens & children to a pulp with the adversarial & over-whelming BC Supreme court legal system.